The answer is root cause analysis, a process that allows you to find the cause of single events/problems in the workplace. The Root Cause Analysis Handbook presents a walkthrough example that illustrates the method and shows how to implement it. 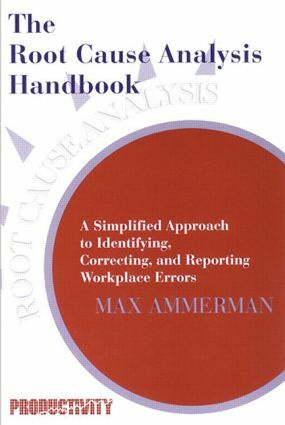 Because poor initial problem definition can (and often does) undermine the problem-solving process, Ammerman places special emphasis on this area to build a solid foundation for effective analysis. He also provides guidance on preparing the final report. The need for clear documentation on dealing with problems makes this book especially valuable for quality managers, engineers, safety managers, and teams implementing the ISO or QS standards. Written in a simple, user-friendly style, you will grasp the core concepts quickly and begin applying them to your work.